Home » Life in London » Digital » No Internet Access! What Can We Do? No Internet Access! What Can We Do? Internet has become the must-have tool for us over the last few years. There are so many things that we have learnt to do online, that I reckon it’d be rather difficult for us to go back to our old ways. So, what can we do without any internet access? Well, we could do loads of things. For example, meet with friends, finish that book we have been meaning to for ages, watch that movie everybody has been telling you about, cook something nice… I tell you what I did this week after I discovered that our internet connection had gone –I tried to find another way to get internet connection at home. I found it disruptive having to interrupt my routine, including blogging. Internet access is one of the first questions we all ask in London when looking for a place to live. We can easily keep on looking if a flat doesn’t have any internet access, ideally included in the bills. We read the news online, as it is easier and cheaper to do so. Media consumption all over the world is increasing. Furthermore, for the Millennials, there is no such concept as being online or offline, as they are always online. In fact, the number of hours that we spend online (overall) has increased in the last couple of years. To be honest, I usually spend one or two days at home on average. So, I try to cook something nice when I am in, talk to those friends and family I don’t usually see nor talk to and read a bit in any way. However, I do use the internet to look some recipes up or checking bits a pieces quickly, so internet access helps me to do some tasks when I am at home. Obsession… Even if I am watching a documentary, I have my mobile with internet access next to me, because people call or text all the time. This is what we call ‘second screen‘, which can also be a tablet. In fact, recent research shows that we are accessing internet via mobile devices these days, including tablets. Now, why do we need a second screen? The Guardian talked about our obsession with online media consumption when reporting about Ofcom 2012 findings. It is not only not having internet access. This is a problem that can be extended to the use of mobile phones, to the point that it has even been named. The UK Post Office commissioned a study last year to the research company YouGov to look at the anxieties that mobile phone users suffered. They coined the term nomophobia, an acronym for no-mobile phone phobia. 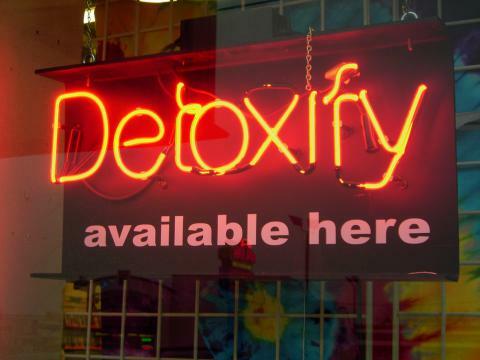 So, detox anyone? The Digital Detox people are organising a detox summer camp for adults in California in mid-June. It will be a 1970’s-boy scout style camp where no technology at all is allowed. Interestingly enough, talking about work is also forbidden. Will they accomplish this mission? What do you do when there is no internet connection or to take a break from your tech toys? I don’t think I could do it for very long. The only time I turn my phone off is when I cross the border into the US. We get nailed for very heavy roaming charges when we use our phones in the US so just before we go over we let everyone know we are turning our phones off and off they go. The first thing we do on our return home at the end of the day is turn them back on. Whenever I travel for work, I try to not take my laptop, so I’ll spend time reading or walking around. That’s a good idea. I need to carry it with me when I’m travelling around, so that’s not an option for me at all. Thanks a lot for your comment!